Laura Marano stops to pose while arriving at a private estate to celebrate the launch of YSBNow on Saturday afternoon (October 17) inHollywood. 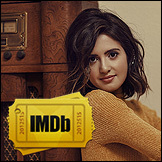 The 19-year-old Austin & Ally alum was joined by Isabela Moner, Albert Tsai, Forrest Wheeler, Asia Monet Ray, Sophie Reynolds, Rio Mangini,Madison De La Garza, and August Maturo. YSBNow (aka You’re So Beautiful Now) is a new online platform dedicated to celebrity content along with positive and empowering messages for teen girls. Guests enjoyed a carnival-like atmosphere complete with treats like cotton candy, snow cones, and a photo booth to capture the fun. They also played with Nerf Rebelle crossbows, enjoyed ice cream cupcakes from Cold Stone Creamery, and took home YSBNow goodies, including a Dolce and Gabbana fragrance and Casio Baby G watches.